Simply adding bacteria to a wastewater plant does not guarantee that they will achieve the targeted task of denitrification. To encourage their growth, it is essential to first establish an anoxic environment, and then introduce a mixer that has been optimized specifically for the process. 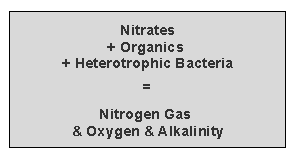 Denitrification in wastewater treatment is the conversion of nitrate (N03) to nitrogen gas (N2). It is a process that involves the reduction of nitrogen present in waste streams to an acceptable level so the treated water can be discharged into the environment via streams, ponds, lakes, etc. Lowering nitrate levels in a waste stream is achieved through creating an anoxic environment in which heterotrophic bacteria use nitrate as an oxygen source to break down organic substances. The first step to achieve efficient nitrification is to establish the conditions required for this process. In the denitrification process, an anoxic zone is created by using an unaerated tank where the dissolved oxygen levels are kept below 1 mg/l and as close to, without reaching 0 mg/ as possible. A target operating point would be between 0.2 to 0.5 mg/l. The concentration of mixed liquid and suspended solids must also be kept in balance. The pH of the anoxic zone should be close to neutral (7.0) and never drop below 6.5. There must also be a carbon source. Typically 2.72 mg BOD5 are required per mg of NO3-N removed. Heterotrophic bacteria obtain their oxygen through the following sequence: free and dissolved oxygen, nitrate, and then sulfate. When deprived of readily available oxygen, as in an anoxic environment, bacteria will use nitrate as an oxygen source to break down carbon, their source of food. 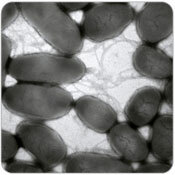 During denitrification, the tank is agitated but not aerated, thereby starving the bacteria of readily available oxygen. This forces the bacteria to break down the nitrate in the activated sludge to use as their primary oxygen source. 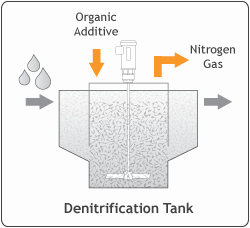 The goal of the denitrification process is to bring the waste stream within permitted nitrogen levels. Impeller design is the most important factor since it determines the directional flow and level of pumping within the tank. Fibrous material, which was not eliminated by screening or grinders in the front end of the treatment plant, may create build-up on a hydrofoil impeller. Accumulation of materials on an impeller can compromise the axial direction, making it more like a radial flow. This increases the likelihood of introducing a swirl or vortex on the surface of the effluent. The result is an incorporation of unwanted oxygen into the tank. An anti-ragging impeller should be used to maintain optimal mixer performance and a strong axial flow. If you are interested in learning more about mixing solutions for denitrification, post a comment below or email us at [email protected]. Do you actually manufacture the denitrification systems or supply only mixers? We are looking for anoxic denitrification system to remove large about 100 mg/L in surface water. Hello Jorge, thank you for your inquiry. Dynamix manufactures mixers, we do not provide complete denitrification systems. We need few mixers for various anoxic reactors having standard height of 4 meter and volumes filled sewage is 12 KL, 10 KL, 8 KL, .The MBBR media fill quantity is 50%. Can you please advise us the mixer details i.e. length , mixer dia, Hp rating, RPM etc. Hello, and thank you for your comment. Since you require a great deal of information, I invite you to call one of our Application Engineers to discuss your needs. Using information about our material, container, and purpose, Dynamix continually chooses a mount, drive, and impeller that are appropriate for the job with friendliness and ease, even after changes are made many times to our plans and purpose.